I’ve got a little giveaway for you today. 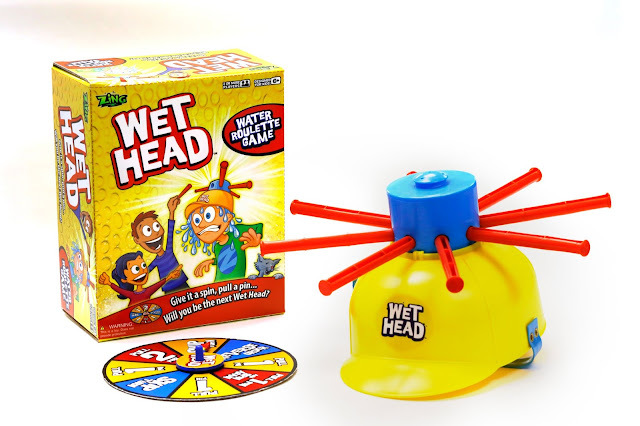 If your kids enjoyed playing Pie Face last Christmas, they’ll love Wet Head. Wet Head is a Russian roulette water game that is bound to have you on the very edge of your seat. Mostly because you don’t want to get your sofa wet. Suitable for ages 4 and over, Wet Head is the ultimate test of endurance. Once the helmet is filled with cold water, it can be passed from player to player until some unfortunate soul ends up covered in water. You can play with the spinner or download the Wet Head challenge app and answer trivia questions in an attempt to stay dry. Or, alternatively, search for #WetHeadChallenge on social media to find home movies of people getting drenched in this fun game. Wet Head is available to buy now, you can get it here for £14.25. I have one copy of the game to giveaway, all you have to do is fill in the Rafflecopter below to be in with the chance of winning.